As the year concludes, I love looking back to remember all the fun and festivities. Yet, one of my favorite celebrations of 2015 actually took place the very last day of 2014. New Year’s Eve isn’t normally on my list of favorite holidays. I learned the hard way by letting my preschooler stay up until midnight one year! The next year we watched the ball drop in New York City on the television and celebrated along with them (it’s only 9 PM here in California). But ladies and gentlemen, last New Year’s Eve I got it mastered. Noon Year’s Eve! It’s the perfect celebration for families with young children who don’t want to (or shouldn’t) wait until midnight to ring in the new year. New Year’s Eve is logistically unfriendly to families based on timing alone. So it’s time to shake it up. And let me tell you, noon is the new midnight. Family-Friendly: New Year’s Eve parties aren’t always kid-friendly. Drinking and finding somebody to smooch as the ball drops … not appropriate for my 8-year-old. Noon Year’s Eve can be whatever you make of it, but I recommend the noisiest of noisemakers, confetti poppers, and DIY party hats. Plus, it’s one more excuse to have a piñata. Bedtimes: Let’s just pretend that I can make it all the way until midnight (I can’t). The kids don’t want to miss out on the fun, but we all know they are not going to help us with our “Yell at the Kids Less” resolution if we’re overly tired on January 1st. Safety: Uber, people. Seriously, it couldn’t be easier to get home without putting people at risk. But we know that there’s the potential so Noon Year’s Eve wins again. Evening’s Wide Open: Some adults may want to go out to celebrate New Year’s. More power to you, you party animals. After celebrating Noon Year’s Eve, your evening is wide open! You’ll get more bang for your holiday buck by doing both. And now there’s no stopping you from your ogling of Ryan Seacrest as he counts it down. Less Party Hopping: Be the only one to throw a Noon Year’s Eve party and your guests won’t feel rushed to party hop. Plus, we all know our tiaras and top hats shine the brightest at the first party. Beat the rest by inviting your guests hours (and hours) before everyone else. 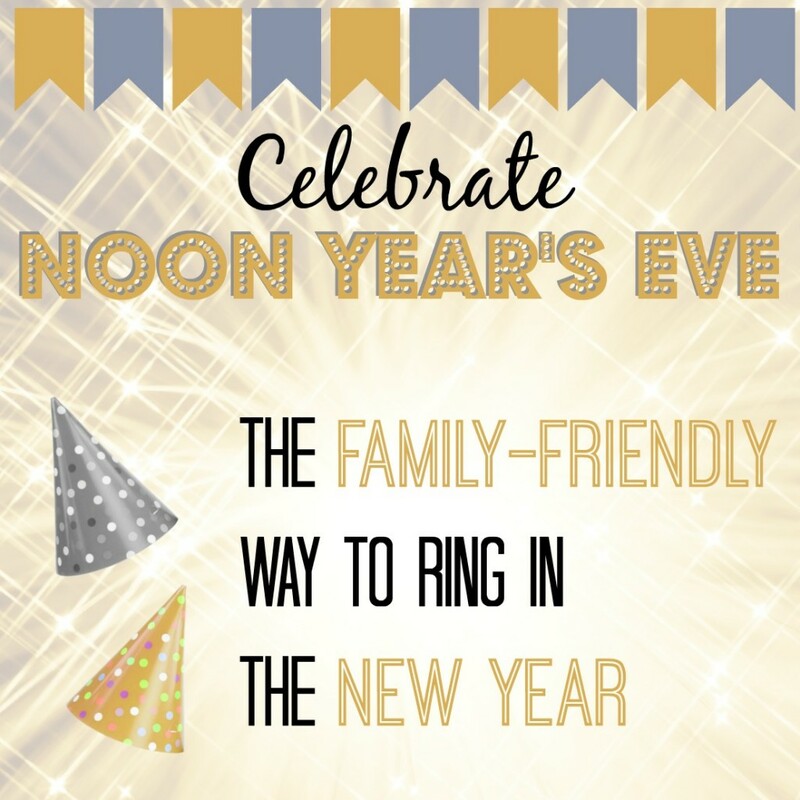 Noon Year’s Eve is the family-friendly way to ring in the new year so that everyone in the family gets to celebrate. Who wants to wait until midnight to celebrate 2016, when you can start celebrating at noon? Now that’s a good idea! Having noon years eve party with your child to celebrate so that they will go to bed still on time and night and you can enjoy New Year’s eve. The idea of Noon Year’s Eve is GENIUS. I can’t believe I haven’t thought of this before. I definitely need to incorporate that into this year’s plans. This is brilliant, I love not being tired when all the celebrations go down ! Especially since midnight is spent in my closet with the puppies b/c they can’t handle the fireworks. What a great idea! Maybe I’ll do this with my kids and then spend the actual NYE with my hubby. Up until midnight is definitely NOT toddler friendly. 😉 I like this idea. My son is too old to do this, but I’ll pass it along to my friends and family with little ones. I bet they love the concept. I love this idea!!! My kids get so exhausted staying up late waiting for the new year to come. They would have a blast doing this with friends. I am all for that idea. My husband is always trying to get us all to stay up and the kids and I get sleepy early! This is perfect for me because I can very rarely stay up until midnight anymore. I don’t even know when the last time I hit that hour was! We were just telling our neighbors about your party last year! It really was the best!! So cute, I love it! We should do this too! Our oldest is finally old enough to understand New Years so this would be a fun family activity. I’ve never thought of this – what a cute idea! This is definitely something we can do with our lil ones. We don’t have any traditions for New Years Eve. Love this idea for the younger crowd though! I will share it with friends who have kids that won’t quite make it until midnight. What a fun idea! I want to do something fun this New Year’s Eve with the trio, will have to come up with some fun tradition for it! Our local zoo did something like this for noon. It is such a smart idea and a fun way to celebrate!